The Shop Your Way Sizzle and Splash Instant Win Game is open only to individuals who are: (i) legal residents of the fifty (50) United States (excluding New York residents) and the District of Columbia at the time of play at least eighteen (18) years old. 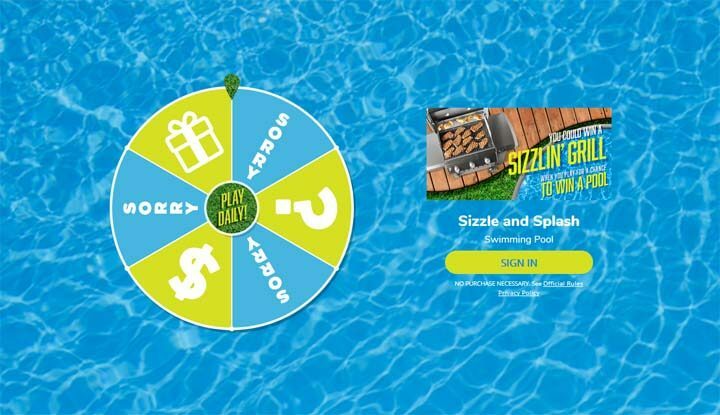 The Shop Your Way Sizzle and Splash Instant Win Game ends on July 5 at 11:59:59 pm CT.
Visit shopyourway.com/sweeps and log into the “Sweeps” application on SYW. Follow the online instructions to complete the entry form. Limit up to three (3) Plays per day per person/SYW Member. Three Hundred Two (302) Prizes and their approximate retail values (“ARV”): Four (4) Grand Prizes: Four (4) Winners will each receive one (1) Intex 12’ x 30’ Metal Frame Pool with Filter Pump designated by Sponsor. ARV of each Grand Prize: $130.00; and Two Hundred Ninety-Eight (298) First Prizes: Two hundred ninety-eight (298) Winners will each receive fifteen thousand (15,000) Shop Your Way points. ARV of each First Prize: $15.00. Total ARV of all prizes: $4,990.00.